Mark Tarlov, the former owner of Evening Land Vineyards launched this winery in 2012 with 4,200 cases of Willamette Valley Pinot Noir. Tarlov brought on Burgundian vigneron Louis-Michel Liger-Belair as consultant to work with winemaker Mike D. "Mikey" Etzel, the son of Beaux Freres winemaker Michael Etzel. Max Marriott, who worked for Louis-Michel in Burgundy as well as top producers in New Zealand, Tasmania, Germany and the United States (Cristom in 2012), took over as winemaker for the Chapter 24 Vineyards wines. He finished the 2013 vintage wines and crafted the 2014 vintage wines. Mikey continued to pursue a side project with Mark Tarlov called Double Zero producing vineyard-designated $300 Pinot Noirs, made with meticulous attention and tiny volumes. Vineyard sources include 29 vineyards in the Willamette Valley in all six appellations including Patricia Green Estate, Hyland Estates, Shea Vineyard, Lachini Vineyard, and Nysa Vineyard. The result is some 70 blocks and separate parcels of fruit. Ryan Hannaford, the former vineyard manager at Seven Springs Vineyard, joined the team as company viticulturist to assist with grower liaison and the biodynamic management of two leased vineyards. Chapter 24 initially intended to have a marketing partnership with Patricia Green Cellars which never reached completion and the partnership is currently with Old Bridge Cellars who co-own the entry-level label, Maison l'Envoye. 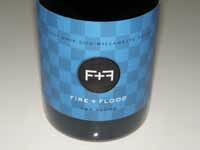 The label, Fire+Flood, offers The Fire and The Flood, priced in the $60 range, that explore the two main soil types in the Willamette Valley, Jory (Fire) and Willakenzie (Flood). The highest end release is Last Chapter, priced at $90, is named for the final scene in "The Odyssey." By 2015, production was 12,000 cases, the majority of which was made for the Maison l'Envoye program, with barrel and lot selections made for the Last Chapter, Fire and Flood bottlings. Fire + Flood tasting room is located in Newberg where you can taste other guest producers as well (Thursday-Monday). Tarlov plans to build a winery and acquire one or two vineyards in the Willamette Valley while signing long-term contracts with several other vineyards.